A 40+ kilometre long trail that will link Lilydale, Yarra Glen, Healesville and join into the Lilydale to Warburton Rail Trail. Work is currently underway to build more than 40 kilometres of trail, connecting Lilydale with Yarra Glen and Healesville, then across to the Lilydale to Warburton Rail Trail, creating a valley-wide loop. The project will help Yarra Ranges become the number one tourist destination in Victoria, and our community will be able to explore and experience their own region in a variety of different ways. The first stage of the Yarra Valley Trail running from Lilydale to Yarra Glen will be constructed in two parts. The section of the trail from Lilydale to Yering has relatively few bridges or other complexities. It will commence construction in early 2019 and is expected to be completed and opened for public use before the end of the year. From Yering to Yarra Glen the trail will require the reconstruction of a number of bridges including a bridge over the Yarra River. This portion of the trail requires more approvals and is more complex to construct. This section of the trail is expected to commence construction in early 2020 and be opened by March 2022. Time frames for stages 2 and 3 of the project are not yet available, and are subject to additional design and project funding. This stage of the trail will have a heritage focus, it will follow the former railway alignment out of Lilydale, through Coldstream and Yering farmland to the Yarra River floodplain. The trail passes over historic timber railway bridges before crossing the Yarra River and arriving at the recently-restored Yarra Glen Station (where Yarra Valley Railway will soon be running steam train services). This stage of the trail will have a food and culture focus, it will run between two popular food and beverage destinations (Yarra Glen and Healesville), passing a number of wineries and the renowned Tarrawarra Museum of Art. This stage of the trail will have a strong focus upon nature. While the final alignment is still to be resolved, preliminary planning includes the trail passing Healesville Sanctuary and running along the Yarra River corridor where it meets the Lilydale to Warburton Rail Trail. Users will have the option of returning to Lilydale, or heading toward the forested hills of Warburton. re-vegetation and land rehabilitation along the edges of the trail as a part of the trail construction. 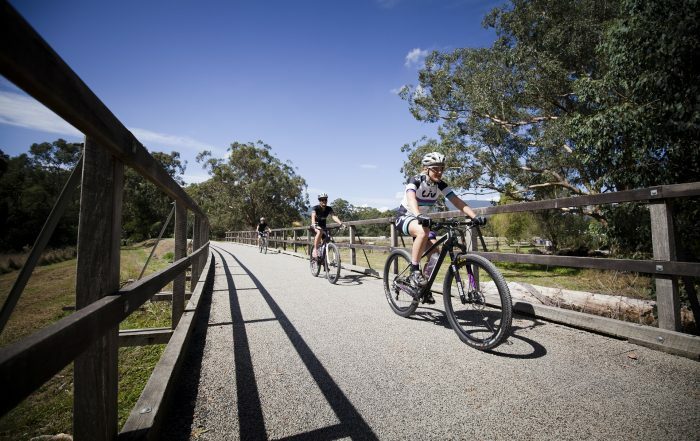 The Yarra Valley Trail project will draw new visitors to the Yarra Valley as well as increasing the length of stay by offering a new visitor activity. It is estimated to attract 210,000 users annually, generate $16.3 million in economic spend and create 120 new jobs. The new trail will complement the Lilydale to Warburton Rail Trail, making the Yarra Valley a top cycling destination. It will add value to and connect major tourist destinations (such as food and wine in the Yarra Valley and Healesville Sanctuary Zoo) and local businesses. Have a look at what’s been happening with the Yarra Valley Trail project. Will the trail cross roads? The trail alignment will require some road crossings. The number of road crossings will be minimised, and will be designed with specialist traffic engineering input to ensure that they are safe. Will the rail trail prevent the rail corridor from being used for trains in the future? Planning for the trail has involved working with Yarra Valley Railway, including agreement regarding the sharing of facilities at the Yarra Glen Station and keeping the option open for a tourist railway between Yarra Glen and Lilydale in the future. The existing train tracks between Lilydale and Yarra Glen are in poor condition and will be removed to accommodate the trail. Extensive bridge and rail construction works will be required to accommodate any future rail provision along this corridor. How is heritage being addressed? The project planning has been undertaken with input from the traditional owners. The rail corridor includes some existing wooden bridges, although a number have been lost to fire and those remaining are not in a safe and usable condition. The design proposed for these bridges includes retaining as much of the existing structure of these bridges as possible, and reinforcing them to make them safe for trail use. How will existing uses be impacted? Stage 1 is bordered by a number of agricultural and other uses, and there is some use of the rail corridor associated with those uses (including crossing points and grazing). These uses are believed to be largely compatible with the trail given appropriate fencing and gates. Similar situations exist along the Lilydale to Warburton Rail Trail and have been successfully managed. Will the trail cater for horse riding? Equestrian use will not be able to be catered for along the full trail alignment as the stage 1 rail corridor between Lilydale and Yarra Glen includes sections of relatively narrow elevated embankments and long elevated structures. Equestrian access will be possible from Lilydale to Yering and in future stages where it is feasible. What material will the trail be constructed from? The Yarra Valley Trail is proposed to be predominantly a hard compacted gravel or ‘toppings’ surface. This surface type has been selected based upon a range of factors including continuing the experience provided by the very popular Lilydale to Warburton Rail Trail, contribution to a rural/natural character, construction cost, and best catering to a wide range of users. Like the Lilydale to Warburton Rail Trail, the trail surface will be maintained to a level that allows use by most kinds of bicycles and riders at most skill levels. Because stage one of the trail follows a former railway alignment, there are no steep hills, sharp corners or other hazards. How much will the Yarra Valley Trail cost and who is funding it? Stage 1 is expected to cost $5 million. Stage 2 is expected to cost $7.5 million. Stage 3 is expected to cost $7.5 million. Stage 1 of the project has received substantial state government funding, including $2.5 million through the 2018-19 State Government Growing Suburbs Fund. Council will continue to seek funding opportunities from State and Federal Government and will also provide a contribution. Will there be stages for the development of the Yarra Valley Trail? The Yarra Valley Trail will be delivered in stages over multiple years. Stage 3 Healesville to Seville East or Woori Yallock. How will the Yarra Valley Trail benefit the community? revitalise the Valley, encouraging new business, attracting visitors and tourism activity, directly stimulating the local economy and creating local jobs for locals. When will the Yarra Valley Trail be built? Construction will commence on the first stage of the trail in early 2019, starting from Lilydale and progressing toward Yarra Glen. The intention is for the first stage to be opened progressively, with some sections of the trail to be opened to the public in mid 2019.